The Labour TD must have thought his Cabinet hopes had been blown by his poor performance in the party’s leadership election. But Joan Burton needed another minister from the capital which made the Dublin South deputy’s appointment to the top table a geographical imperative for Labour. Big promotion. Big challenge. Chance to really help people in a meaningful way. It’s thought that Reilly – who was always going to be dropped from Health – was on his way to Foreign Affairs until he protested. So he was given the Department of Children. Not as prestigious but certainly more along the lines of what he is interested in. He’ll be able to pursue policies on anti-obesity and anti-smoking – the latter being a particular passion of his. Few outside the political bubble and Cavan-Monaghan will have heard of the Fine Gael TD who is now the new Arts Minister. It’s a huge promotion for Humphreys who will now need to raise the profile of a ministry that will become increasingly important in the run up to the 1916 commemorations. The Louth TD is a popular figure in Labour who may have only expected a junior ministry in the reshuffle but he’s gone one better with a super junior position in the Department of Jobs that allows him to sit at Cabinet. Nash will be particularly focussed on Joan Burton’s big idea for a low-pay commission. The Labour deputy leader expected to be in Cabinet and now he is but how happy will he be being placed in the politically troublesome Environment portfolio? When it was Phil Hogan’s it was a lightning rod for criticism over the household charge, septic tank inspections, property tax and lately the water charges. What will voters think of Kelly when those water bills start coming in the door in the coming months? Not much, we’d guess. Pat Rabbitte said to have had a face “like thunder” when he was told that he was being dropped from Cabinet by Joan Burton earlier. A lot was said about Rabbitte’s reaction to being told he wasn’t being kept in Cabinet on Friday, but it’s undoubtedly clear that he wasn’t happy at all. That much was apparent from an interview he gave to the News at One in the immediate aftermath of the reshuffle announcement. The question now is whether he retires quietly to the backbenches or makes trouble for Burton. The Arts Minister was rumoured to be the subject of a late reprieve amid previously widespread expectation that he would be dropped from Cabinet. But alas he got the bullet and has been demoted to a Minister of State for the Diaspora in the Taoiseach’s Department. Deenihan’s term at the Department of Arts was notable for controversies around turf cutting and the Limerick city of culture debacle. Having been given responsibility for the day-to-day running of the Defence Forces last month, the government chief whip might have expected to be made the full Defence Minister in the reshuffle. But it wasn’t to be as he retains his junior ministerial responsibilities while Agriculture Minister Simon Coveney gets extra responsibility as the official Minister for Defence. Many expected the reshuffle on Tuesday or at the latest Wednesday but nervous TDs waiting for the phonecall were not put out of their misery until Friday. And for the junior ministerial hopefuls the wait goes on into next week, probably Tuesday. Like politics? Then ‘Like’ TheJournal.ie’s Politics page? Email “Here are the 5 winners and 5 losers from Enda Kenny's big Cabinet reshuffle”. 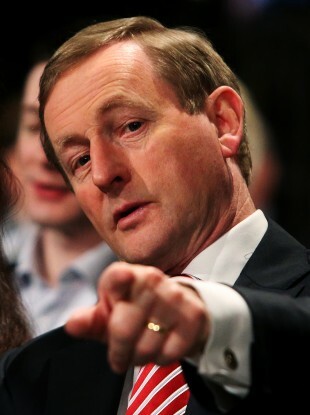 Feedback on “Here are the 5 winners and 5 losers from Enda Kenny's big Cabinet reshuffle”.